Tajikistan has a population of about 8,161,100 people. Among them, 11.1 million are the subscribers of GSM-network, with 6.5 million people being active users. Despite expensive communication operators' revenues increase with each passing day. According to official estimates, their profit was $ 240 million last year. GSM-connection in Tajikistan is more expensive than in Armenia and a number of countries of the former Soviet bloc. At the same time, there is GSM-connection of the poor quality. The reason for this is the climatic and geographic conditions as most of the country is located in the mountains. The best coverage is in major cities and the capital. 99% of the territory is covered by such mobile operators as Tcell and Babilon-Mobile. Each of them has more than 2.5 million subscribers. Besides, Babilon-Mobile covers more than three hundred cities and districts of Tajikistan. Users report excellent conditions that the operator that it provides for mobile users. 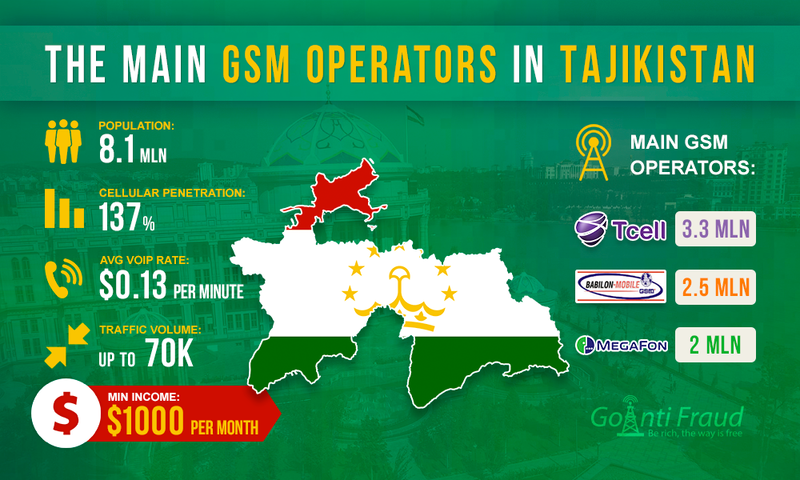 There are two other operators - a Russian-Tajik joint venture "MegaFon" and "Beeline Tajikistan" (GSM "Takom"). The shareholders of "MegaFon" are OJSC "Tajiktelecom" and OJSC "MegaFon". "MegaFon", headquartered in Russia, operates in many countries, and it provides high quality communication and has about 2 million members in Tajikistan, whose number is steadily increasing. And finally, the fourth operator is "Beeline Tajikistan", in its rightful place in the number of users and the quality of communication. For termination GSM Tajikistan it is important to analyze the quality of coverage and the cost of packages, their terms and conditions. Thus, the "Aҷoib 2016" and "Salome 2016" tariff plans from "T-Sel" operator are the cheapest and profitable. One minute of conversation, at the rate of 3-4 days for a few hours costs as little as $ 0.00015. The main condition to connect them is that you should prepay $0.13. The tariff plans "All inclusive: XXS" and "All Inclusive: XS +”, the operator "MegaFon Tajikistan" are slightly more expensive, with $0.00072 and $ 0.00093 a minute. The precondition to connect is an advance payment for 10 days. The packages are in demand as all outgoing calls are free within the above period. One minute of a call will cost $0.0008 when connecting package "All in one 5" and "Non-Stop 2016" from "Beeline Tajikistan". Here, as in other countries, the cellular company offers free calls within the network, but once a week you need to pay a starting balance of $0.64. By the way, on Voip Forums the greatest demand is for landing call services at $ 0.1328 per minute. It is not difficult Calculate the final gain on termination. Based on 3 days per minute difference will be at least $0.132. If you multiply it by 900, we get $118.69 for three days. And over a month it makes about $1,187. It is best to place the equipment in the cities with the best communications: Dushanbe, Khujand, Kurgan-Tube, and Kulyab. Additionally, you can connect GoAntiFraud, which will help keep SIM-cards and significantly increase profits of the terminator.